Updated Thursday February 15, 2018 by Waxhaw Baseball. To provide a fun, balanced, & competitive league where all players have the opportunity to excel in their abilities and enjoy the sport….all while making the best efforts of honoring the traditions of WAA and the relationships built by its players and families. Full Evaluations for All Players in the Rookie Machine Pitch(7-8), Minors Kid Pitch(9-10), and majors Advanced Kid Pitch(11-12) are required in the Spring Season. Please look for Date Announcements. 1. "Why does WAA Baseball continue to making adjustments to draft process?" The best experience for a baseball league and its players is if the competitive balance of teams can be created fairly at the beginning of a year. I think we can all agree, as we commend those teams for working hard and improving their skills, it is not good for them, nor the losing team to be overly dominant for the vast majority of the games. Competitive games enhance abilities. Slaughter Rule(10+ run) wins/losses the majority of the times do not. 2. "Is WAA a complete Reset Draft or Partial?" WAA teams/divisions that partake in the draft are given the ability to start with 4 returning coaches along with their players.... The surrounding leagues in the area do perform a full reset draft each year. With much input from WAA families, Maintaining a coaching nucleus(4 coaches) on as many teams as possible is a benefit for our children. 3. "How often will we perform FULL Evaluations that all players have to attend? How can you guarantee they will be fair?" How Often- Evaluations for all players will take place in the Spring Only. Teams selected in Spring will stay as is for the entire year. Only New Players will be evaluated in the Fall. Roster spots left vacant in Fall by Spring player (playing another Fall sport for instance) will be filled by new players. a. Indoor facilities will be available, as to not let weather disrupt our eval dates (like last season). c. One coach from each team and an outside Rating Official will work as a group to decide a players grade/rate. Rating Official will be responsible for finding the average fair consensus of coaches. *This is especially helpful because many coaches have prior knowledge of players and their abilities. If a player is having a 'bad day' at evals, that can be compensated for by coaches' group knowledge. d. We will look to have each players eval complete between 30-60 minutes, therefore there will be no waiting around for a couple of hours. Once done, a player may leave, no need to wait for others * Please note there may be slight extra time for pitchers. 4. "My family strongly believes that the WAA tradition of staying with a previous coach is beneficial to my player. Will this opportunity be taken away? The opportunity to play with the previous seasons coach Will Be Available to your player As Long As it does not move the fair skill balance of a team in comparison to the other teams in the division. In other words, we cannot have a full team of 5 star rated players that dominate the league. But if a team can stay within the team rating points and is equally competitive with the remainder of the teams, the League see's no reason why it should prevent this from happening. VERY IMPORTANT **The Trade option is specifically designed to satisfy this request. For Example: If Team Alpha & Team Bravo have two similar rated players, but the player on Team Alpha requested his former coach of Team Bravo, this trade is Required to be made to satisfy the request. The league see's absolutely no competitive fairness reason that should prevent this from happening in this case. As much as this is not a 100% guarantee, the League will work hard to fairly satisfy these requests. 5. "Why does this process have teams start with 4 coaches and their players, Rather than just start with any 4 players?" We do not want to put our coaches in the unfair position of choosing amongst players. This is uncomforatble to say the least. If we revolve this around the coaches that can have the time to train our children, It guarantees a full coaching staff for our teams which betters the experience for all of our players. 6. 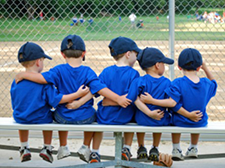 "I respect my coach and enjoyed playing with him/her, but I also think my child should get a diverse training experience with WAA Baseball or any sport. Is my child required to stay/request same coach? No...WAA strongly respects(and encourages) decisions like this. There is no 'one size fits all method' that works for all players. If diversity / variety is best for your player, the league and all of its coaches support such decisions. We are all here for the benefit of your children, plain and simple. 7. "After reading the draft rules, it seems like a lot of work to get this done and a very complicated process. Are you sure this will work?" Simply stated...Yes, we believe so. As we cannot predict which teams will win and which will lose during the course of the season, or that every team will end up equal at the end of a season...We do guarantee that every team will enter each new year with a fair shot. What will happen after that? Very simple... there will be a 1st place team, a last place team, and teams in the middle....and no matter what those records are, as long as we see a significant decrease (from past Springs) in the dominant Point Differential occur, we wil be successful as a League. As far as the work this will take...Yes, it has been and will continue to be a lot of work for the Commissioners for atleast once a year. But we will work hard so this process will be easy for the players, their families, and the coaches. If it benefits our children's experience, it will be every bit worth the time spent. Will we hit a couple of small bumps? Maybe, but we will be ready to adjust or tweek accordingly to make it good for all. 1) Listening to our customer. At WAA, we are always looking for your thoughts to help maintain our philosophy. 2) Competitive balance. The goal of WAA Baseball is to teach our players the game and have fun doing it. While winning isn't everything, never having a taste of it isn't much fun either. Therefore, in the coming seasons, the Draft Process will experience changes to keep up with the needs of our players and maintain a fair competitive balance. While no Draft / Team Selection process is perfect, we will continously strive to make them as fair as possible to all of our players. Since it is also a topic that generates plenty of friendly discussion, please feel free to send in any questions or concerns you might have. As noted, no process in this area could likely achieve perfection and if there's an improvement that could be made, it will certainly be considered.